Project Bookmark Canada thinks you are. We want your passion, your voice—and $20. Throughout the month of April, 30 prominent readers are championing Bookmark, telling us why they are Project Bookmark Canada Page Turners. Beginning on April 1, check this space to hear their reasons—and find your own. 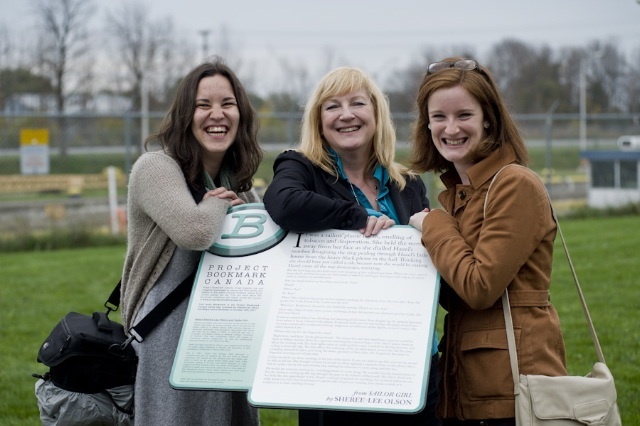 Keen readers Kate Burgess and Kate Icely celebrate with author Sheree-Lee Olson at the launch of the Bookmark for Sailor Girl at Lock 8 in Port Colborne.